What a month it has been since I last wrote! The time has been busy (as always!) with finishing up one job, preparing for the next, getting to meet my first amazing granddaughter, taking two trips, and preparing for several lecture/workshops as well as trying to get two big crazy quilt projects finished! 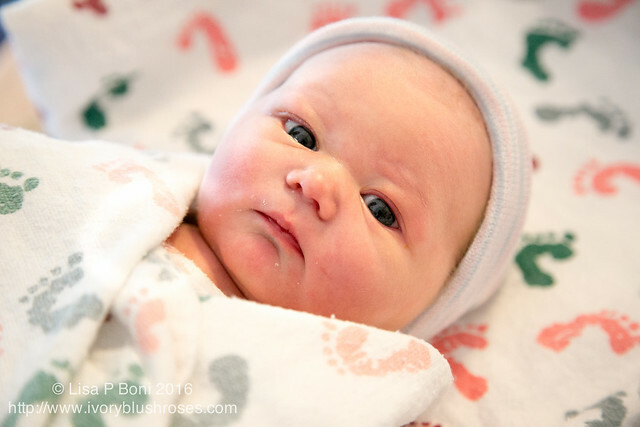 Meet Eleanor Josephine! What a blessing to get to meet this lovely little lady! 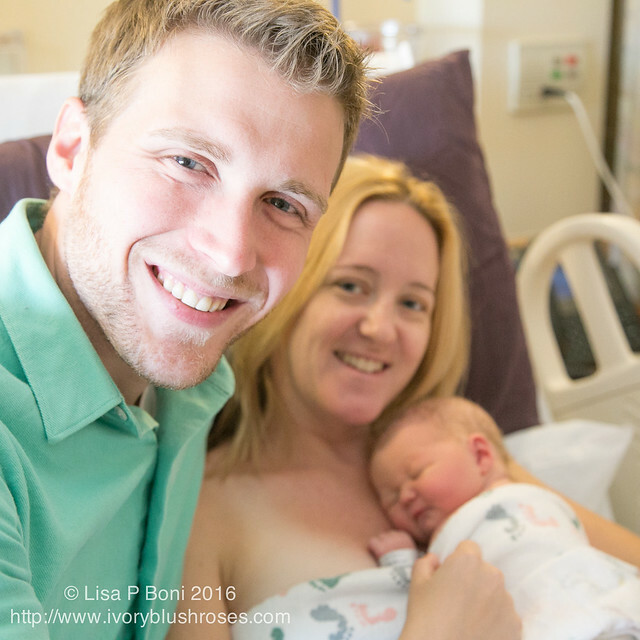 From the moment I first picked her up, she made the most incredible eye contact with me ~ and she has the most gorgeous blue violet eyes! What a sweetheart! Mom and Dad are pretty amazing too! So blessed to have them in my life! 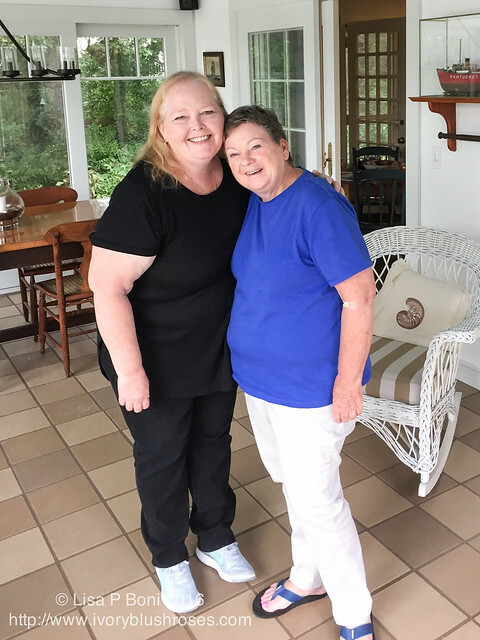 Next up was a trip to Cape Cod to see my dear friend Di! What a magical week! 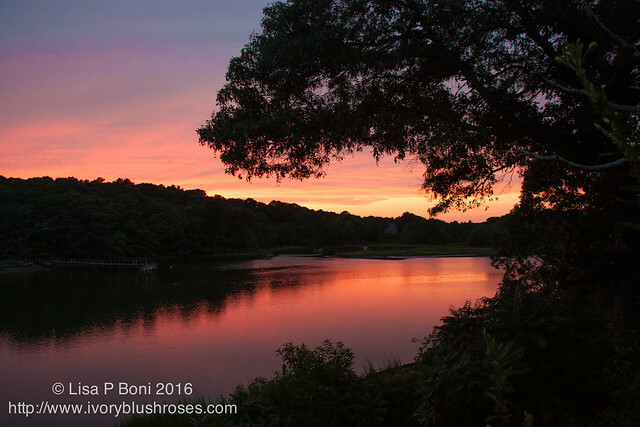 We talked non-stop for 7 days straight and saw so many beautiful places on Cape Cod! Thank you Di for a truly amazing and rejuvenating week! 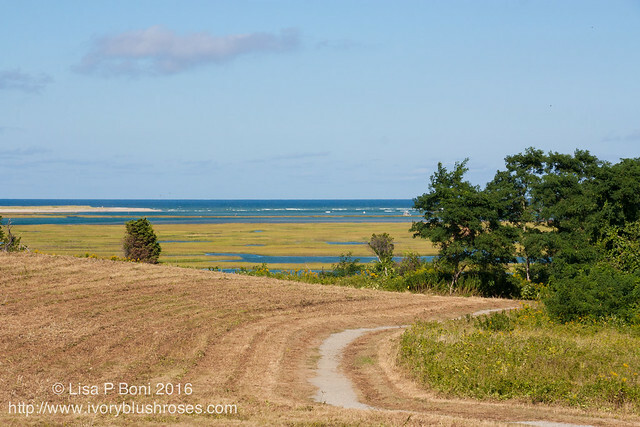 On my first full day there, we stopped first at Fort Hill where one can get a good look out over Nauset Marsh. Since I am a huge Henry Beston fan, and had just re-read his book "The Outermost House", I really loved this view! 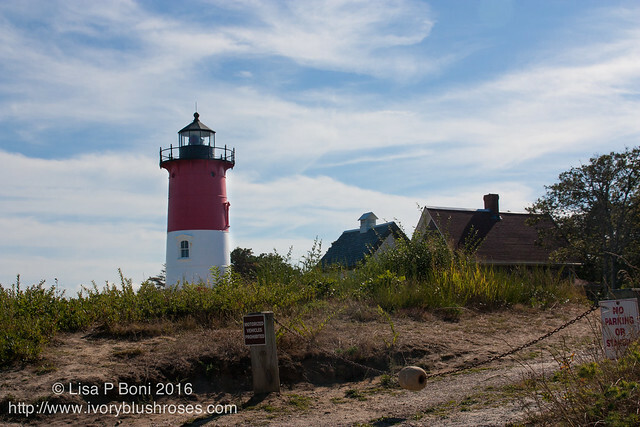 We stopped to see Nauset Light. 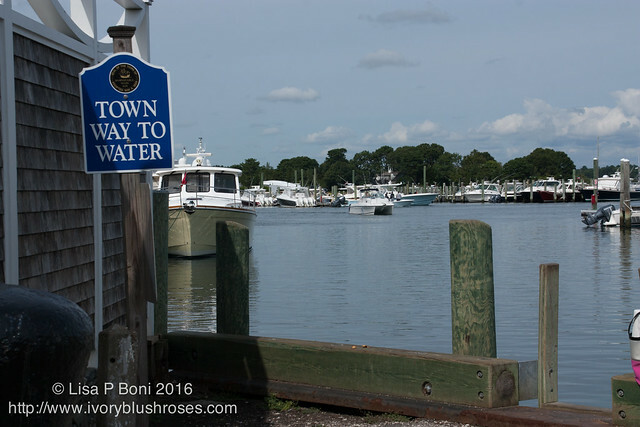 Such an iconic emblem of Cape Cod! In Wellfleet, we stopped to take a short walk out on the beach. 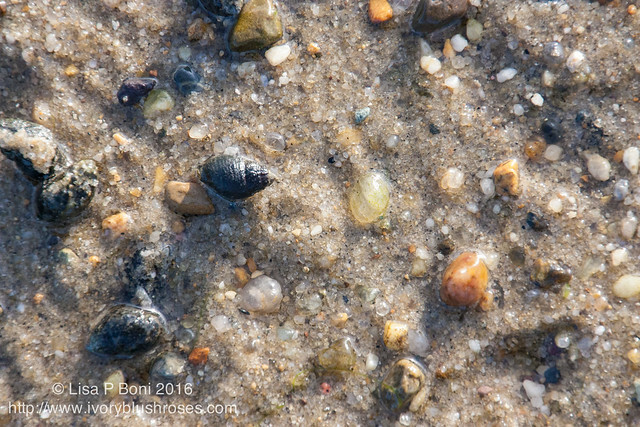 I was fascinated by the sand snails, which in some places were gathered in huge clusters! So much variety in the composition of the sand as well! As we headed home, the most glorious sunset! The next morning, dawned lovely and so we headed out to sea! (actually, it was Nantucket Sound!) Di and I waited at the town dock for the boat to arrive from it's mooring location. Here she comes! For this land-lubber, this is pretty exciting stuff! We were joined by Di and John's family and another friend for the journey. Once underway, Di read a story to her granddaughter! 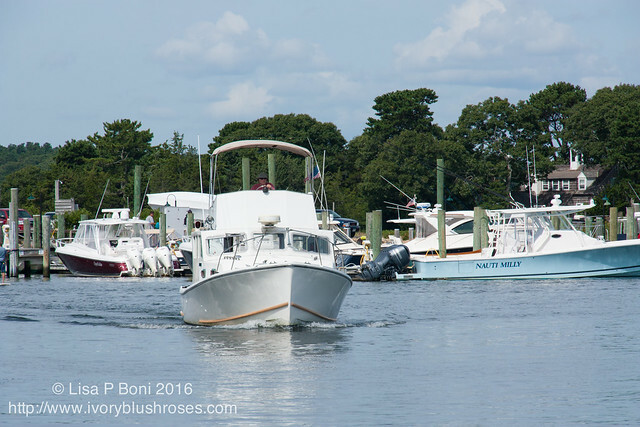 We visited the harbor at Falmouth before heading to Vineyard Haven on Martha's Vineyard where we moored for lunch. 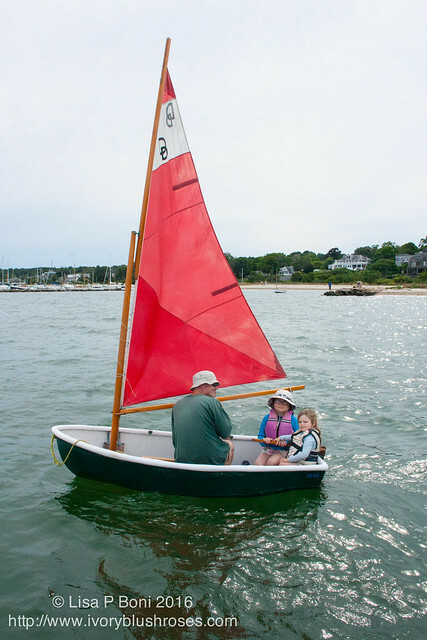 Mike took his daughters sailing in the little dinghy sailboat! What a perfect little boat it is! Right out of a storybook! 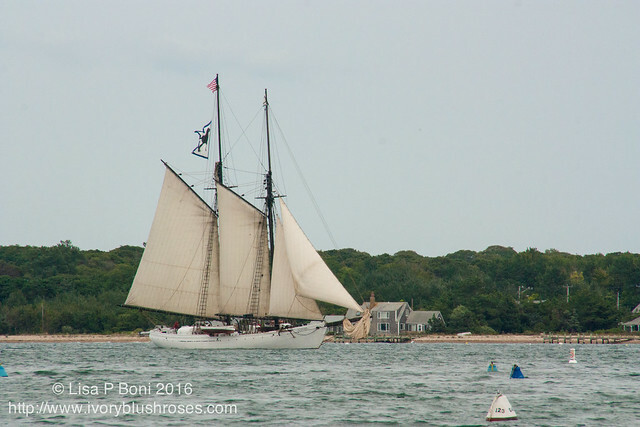 There were lots of lovely boats to see, including this pretty masted schooner! Mostly I was fascinated by the dinghy (the same one that turned into a sailboat!) as it was pulled behind the big boat! 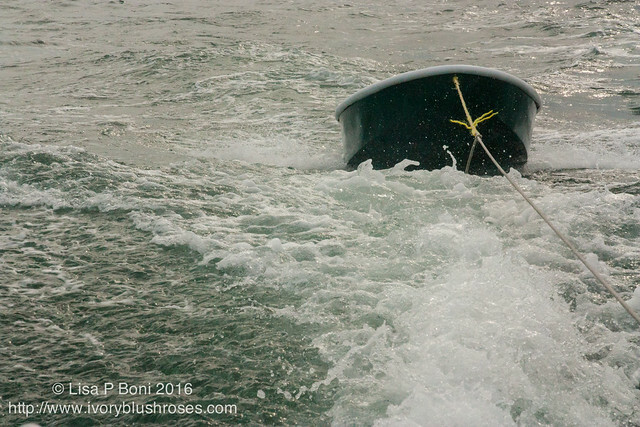 Loved watching it interact with the wake from the big boat and the swells on the water. 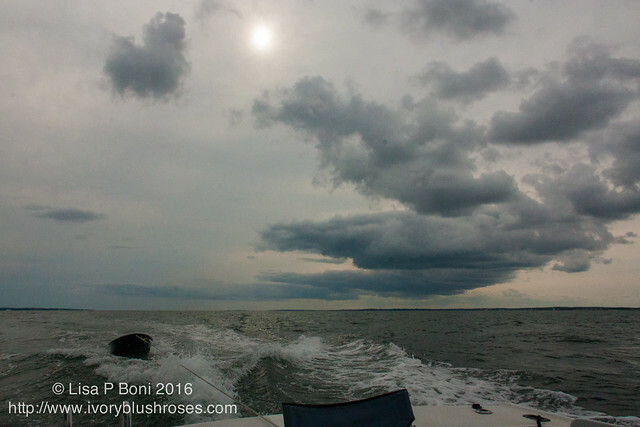 Late in the afternoon, the clouds from tropical storm Hermine started to gather in dark bands across the sky, so we made our way homeward. 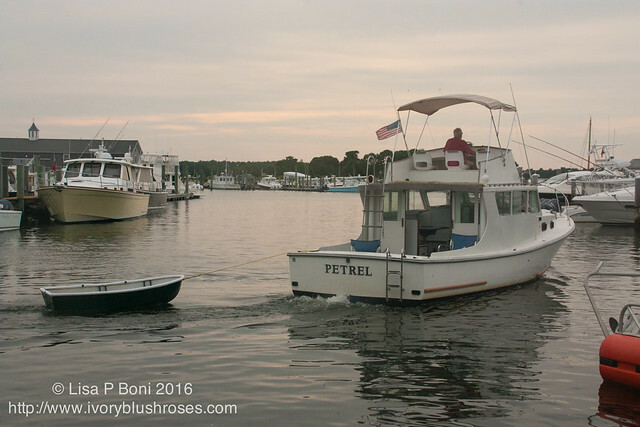 Once we unloaded, the Petrel and dinghy headed back to their mooring spot! Such a lovely day ~ a perfect way to spend a day of Labor Day weekend! 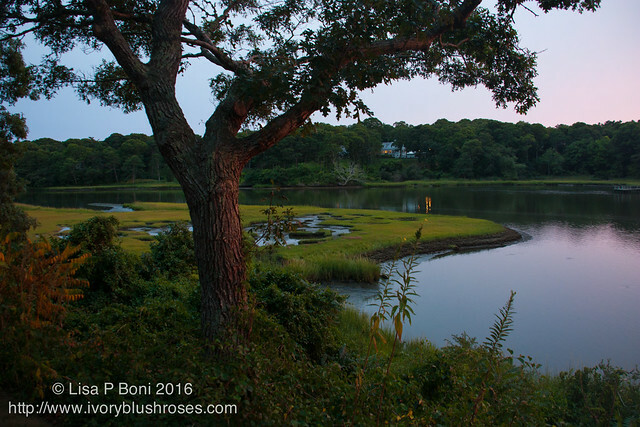 Back at the house, I enjoyed the views of the marsh on the tidal river. 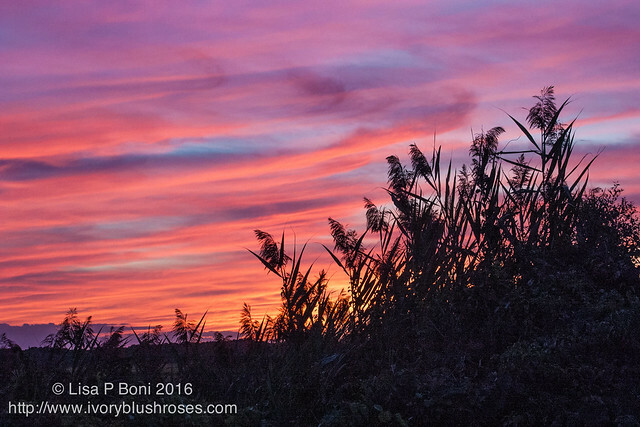 Another lovely sunset to end a perfect day! 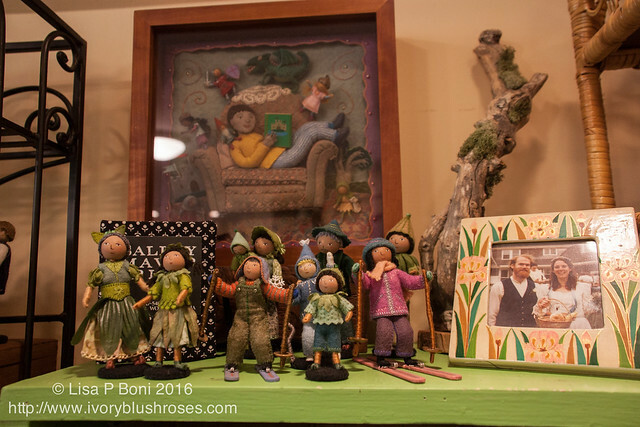 For my third day on Cape Cod, I had discovered that one of my favorite needle artists was having an open house! Di was happy to go with me! 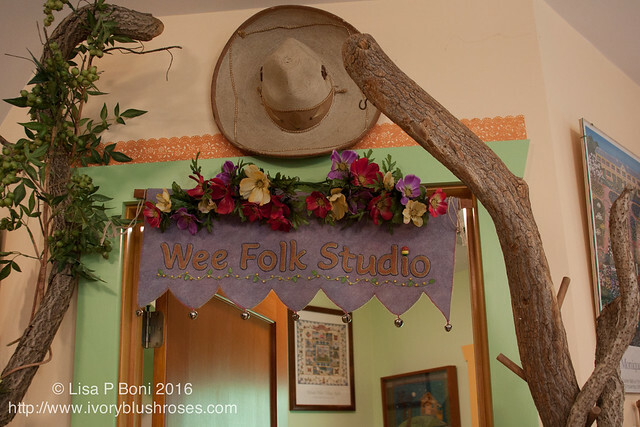 What a treat to see Salley Mavor's delightful studio space! 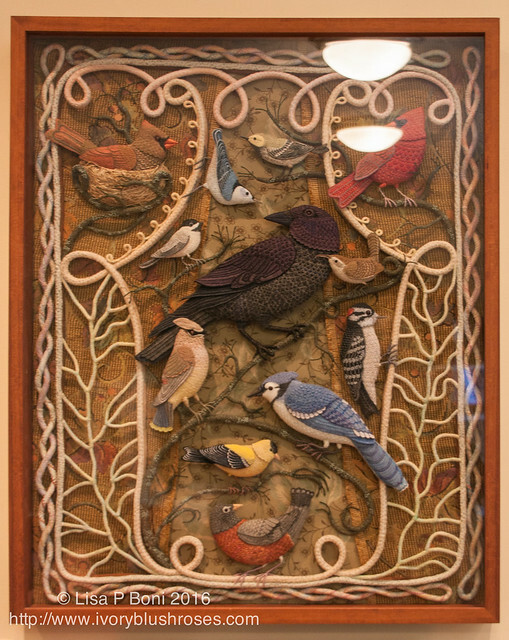 One of the things I had hoped to see was her "Birds of Beebe Woods" piece. My photo doesn't begin to do it justice but you can read more about it and see far better photos on Salley's blog. 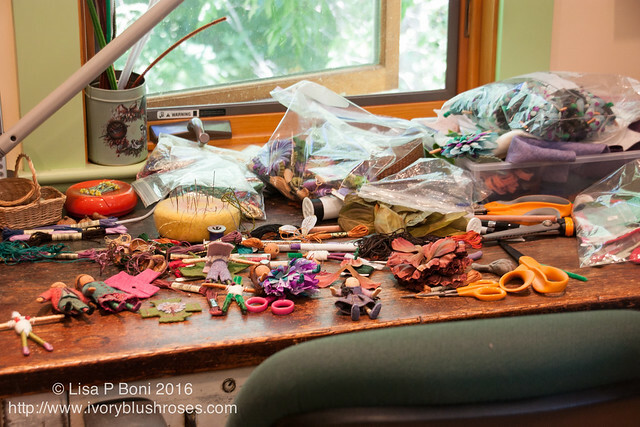 I loved seeing her work table covered in makings for her Wee Folk. So delightful! And can you see the amazing 3-D illustration behind them? Her studio was full of wonderful works of art that you can see in her illustrated children's books! 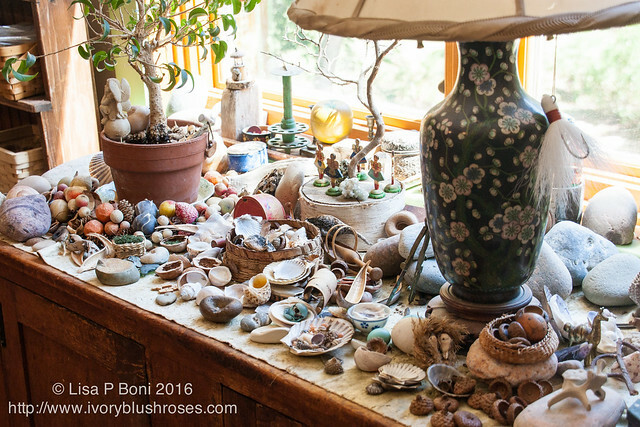 I was fascinated by her nature table, which bears a striking resemblance to my kitchen windowsill! Except that hers has more seashells and sea related items, where mine is more related to mountain forests and southwest deserts. It was such a delight to meet Salley and to have a few moments to speak with her! I can't believe that I didn't remember to have a photo taken with her! Maybe another time! She is such an inspiration to me, that someone can make a living from her whimsical and wonderful work. Salley truly creates a magical universe! If you ever get a chance to see her work in person, definitely take the time to do so! 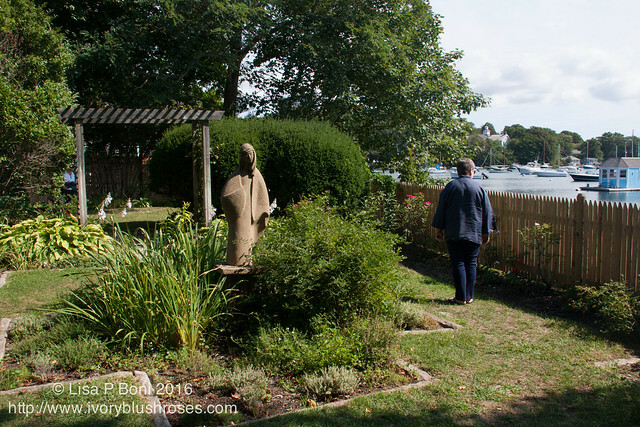 From Falmouth, we made our way to Wood's Hole where we spend some time in an exquisite little seaside garden tucked between the street and the bay. 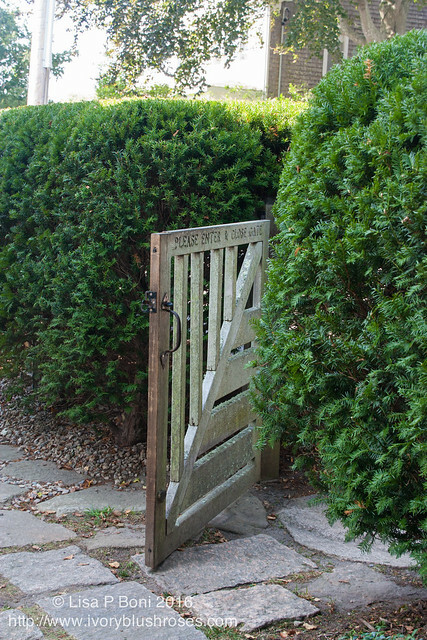 Little rooms of peaceful garden space. I imagine that earlier in the year when everything is in bloom, it is exquisite. 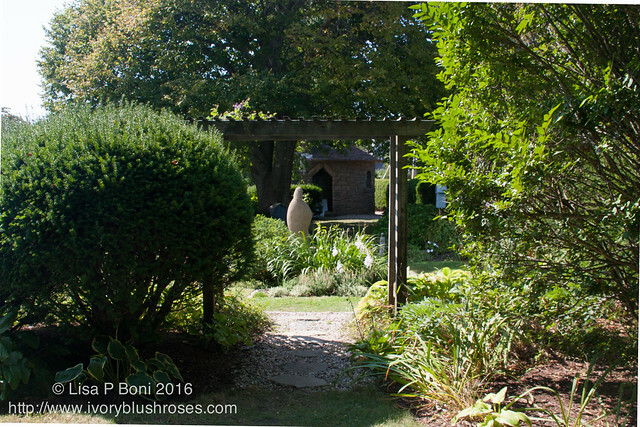 Even so, with signs of autumn all around us, it was still a lovely peaceful place. After a few more stops (bookstores and antiques!) 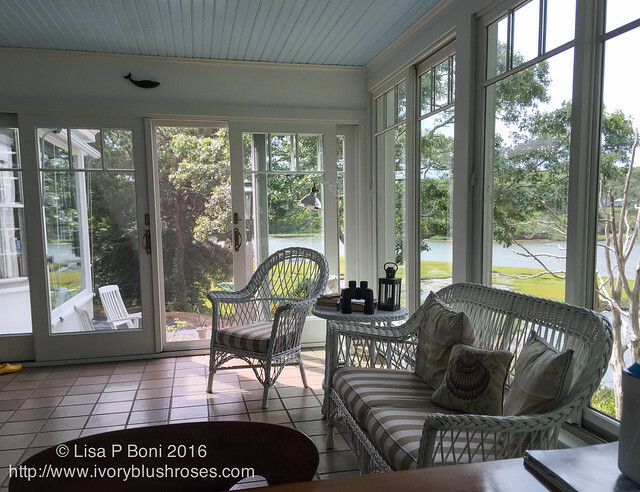 we made our way home and spent the rest of the evening talking on the sunporch while enjoying views of the river and marsh! More to come ~ I'll post more about my trip tomorrow! What a sweet and lovely post! I'm glad you had such a wonderful time, meeting your new adorable granddaughter, meeting friends and a fellow artist. Sally's work is wonderful and happy. I really loved the little wee folk in the seashells. Her work inspired me. 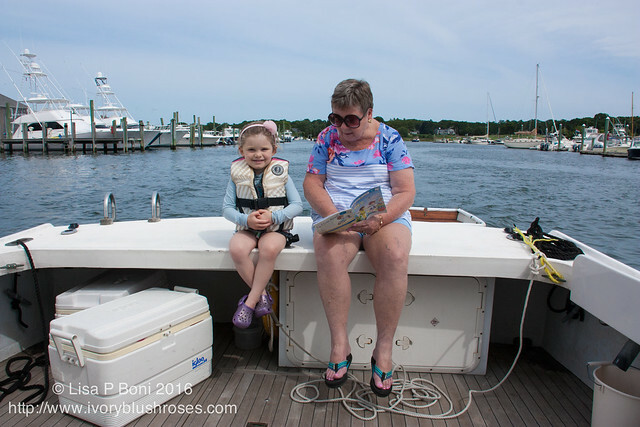 Wonderful photos and account of your precious granddaughter and trip. And you got to see the Wee Folk too!!! What an interesting catch up:) Always miss you but seeing all you have been doing has been wonderful. Love your favorite's shop. I bought 'The Outermost House' as an impulse buy after reading your recommendation of it. Now halfway through and absolutely loving it - thank you for the recommendation and for your beautiful pictures. We visited Cape Cod from the UK about seven years ago - wish I'd read the Henry Beeston book then.